TL;DR: Following the end of manned missions to space, NASA Kennedy Space Center saw a drastic decline in visitation. My team was tasked with reviving the brand through an evergreen brand strategy that captured and built upon the momentum of the public's new-found fascination with space and Mars. Ultimately, the property tracked at a 14% YoY increase while I ran the account from the digital and partnerships perspective. As the digital account executive, I oversaw high-level strategic decisions around Kennedy's digital brand presence, crafting seamless user journeys between touch points that better connected the in-park experience with Kennedy's target audience, and collaborating with players like National Geographic and Smithsonian. 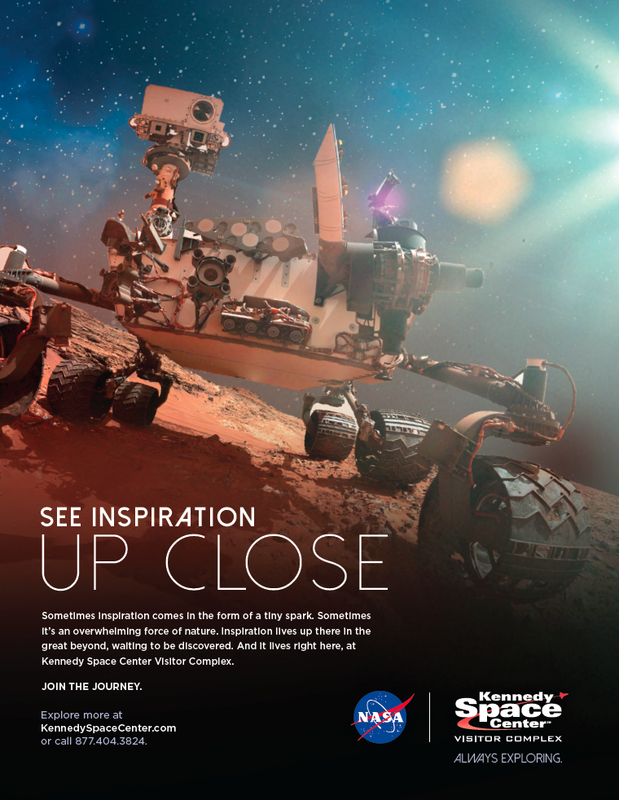 Together, we inspired the next generation of explorers with compelling print, tv, and digital creative. Kennedy was in need of an evergreen brand campaign. Following the end of manned missions, they needed a way to communicate that exploration was still happening at Cape Canaveral. I oversaw high-level strategic decisions around Kennedy's digital brand presence, crafting seamless user journeys between touch points that better connected the in-park experience. Within this campaign, I pitched, developed, and led 9 out of scope projects totaling close to $26,000, and supported an additional $25,000-worth of organic growth beyond this. I oversaw media partnerships totaling over $1 million, led bi-annual strategic planning meetings with representatives from National Geographic and Smithsonian to develop a online content and optimize online marketing. I also helped to increase our media partnership commission earnings by 120% year over year. I maintained the high-level roll-out strategy, working directly with the agency's media director and creative director to bring the campaign to life. 2016 Effie Awards Submission, narrated by yours truly! Kennedy Space Center Visitor Complex (KSCVC) had been losing traction with the public since the manned space program came to a halt. In a world without shuttle launches, KSCVC was at risk of becoming irrelevant, not only in the Orlando market against properties like The Wizarding World of Harry Potter, but also at a national level. KSCVC had fallen out of the conversation, even as the interest in space began to re-enter pop culture. Beyond serving as an official and historic site, KSCVC is an operational space center and laboratory seeking to kindle humanity’s curiosity of space and thirst for scientific knowledge. We needed a visually stirring and inspiring campaign that positioned KSCVC in the cultural conversation and showcased KSCVC as a spaceport of the future. Our over-arching marketing objective for the client is to boost visitation threefold by 2022. We aim to reach this goal incrementally year over year. In our print series, we seek to drive awareness to a wider target audience than in previous years through media placements at a national level. Our goal was sell the future of space exploration, not just the past, and inspire people to visit – joining us in the journey towards the future. Through this campaign, we continue to position KSCVC as the best place on Earth to immerse yourself in exploration. We identified two major demographic/psychographic segments - Space Enthusiasts and Educational Families. Space Enthusiasts currently make up 50% of visitors while Educational Families make up 30%. Nevertheless, the opportunity lies in the fact that the Educational Families demographic is more than twice as large as the Space Enthusiasts: 25.1 million U.S. adults vs. 11.5 U.S. adults. Our job was to spread the gospel to the Educational Families – widening the reach – while maintaining our relevance with the Space Enthusiasts. Kennedy Space Center Visitor Complex is the launch pad for inspiring conversation about the future of space exploration. In the print series, we demonstrate that KSCVC is the gateway to NASA and space exploration, and invite those who are curious and passionate to join us on the journey. While communicating clearly that KSCVC is an active space port, we aim to celebrate the adventurous reader and offer them an outlet for their desire to get closer to space travel. We then drew from our personas and user journeys for both target segments to develop a media strategy that delivered our goal of connecting with the target audience where they’re most likely to already feel inspired. The answer was National Geographic and Smithsonian media properties. Through these mission-aligned media partnerships, we sought to deliver future-focused creative that increased awareness of KSCVC among the curious masses, not just the space geeks. We were well on our way to reaching our 2022 goals. 90% of readers exposed to our ads have a favorable opinion of KSCVC, with 60% of them stating that they are likely to visit. The campaign also drove a 23% increase in awareness that KSCVC is an active launch site and site for the development of space exploration. Most importantly, visitation for our client has increased 13.8% YTD over last year.